Earlier, the Election Commissioner, along with his team, arrived at Gannavaram Airport. 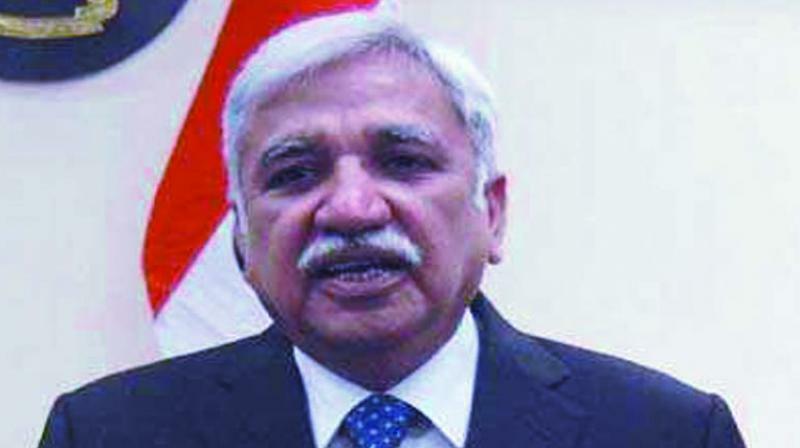 Vijayawada: Chief Election Commissioner of India (CEC) Sunil Arora interacted with the leaders of main political parties individually here on Monday at a private hotel and took their suggestion to conduct safe and smooth elections in 2019. The meeting was attended by AP State Electoral Officer Gopalakrishna Dwivedi, other officials Ashok Lavas, Umesh Sinha, Sandeep Saxena, Sandeep Jain, Dileep Jain, S.K. Rudola and Shefali Sharan. Political party representatives who had attended the meeting were: Mahesh (BSP), Tantiya Kumari (INC), Jelli Wilson (CPI), Y.V. Rao and J. Prabhakar (CPM), G. Chitti Babu and Jupudi Rangarao (BJP), K. Pattibharam, G. Ramesh (TD) and K. Parthasaradhi and T. Lakshma Reddy (YSR Congress). Earlier, the Election Commissioner, along with his team, arrived at Gannavaram Airport. They were received by District Collector Imtiaz and Joint Collector Kriti Shukla.